All Yoga Travels Tours offer 1 yoga class daily and other yoga activities throughout the tour. All Bhutan visa and tourist fees are included in this tour. 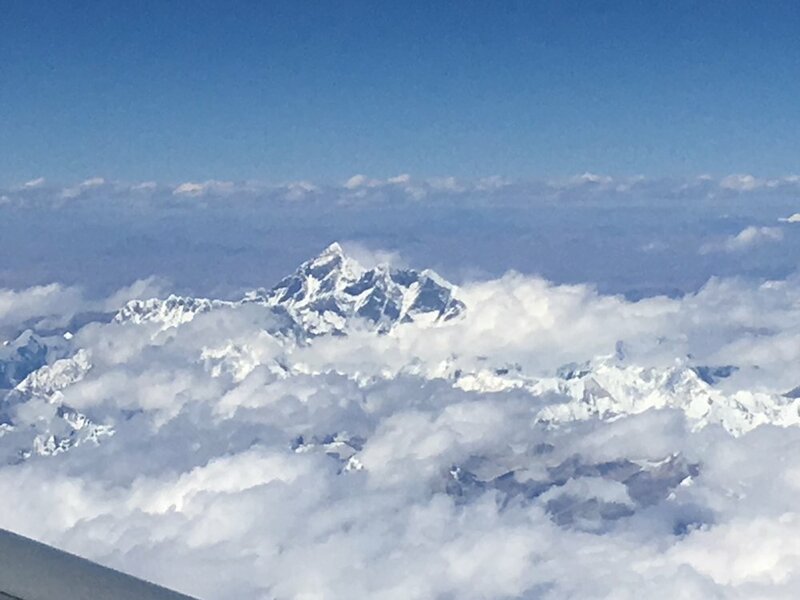 Mountains, including Everest, and the sacred Jumolhari and Jichu Drake peaks in Bhutan. In the afternoon we will visit the National Museum which provides an excellent overview of Bhutanese history and culture. Shaped like a conch shell, it was completed in 1656. The museum holds the largest collection of artifacts, textiles and antiques in Bhutan. Morning Yoga at Hotel. After breakfast you will drive to the North of Paro to see the view of Drugyel Dzong, which was built in 17 century. You will visit the Paro Dzong: Standing high over the Paro valley, this fortress is a landmark in Bhutan. In 1644 Zhabdrung initiated construction of this massive temple-fortress on the foundation of a monastery earlier built by Guru Rinpoche. We will then visit Kyichu Lhakhang, this temple was built in 659 by the king of Tibet. It holds down the left foot of an ogress whose body covers Bhutan and most of eastern Tibet. In the afternoon drive to Thimphu, the capital of Bhutan. 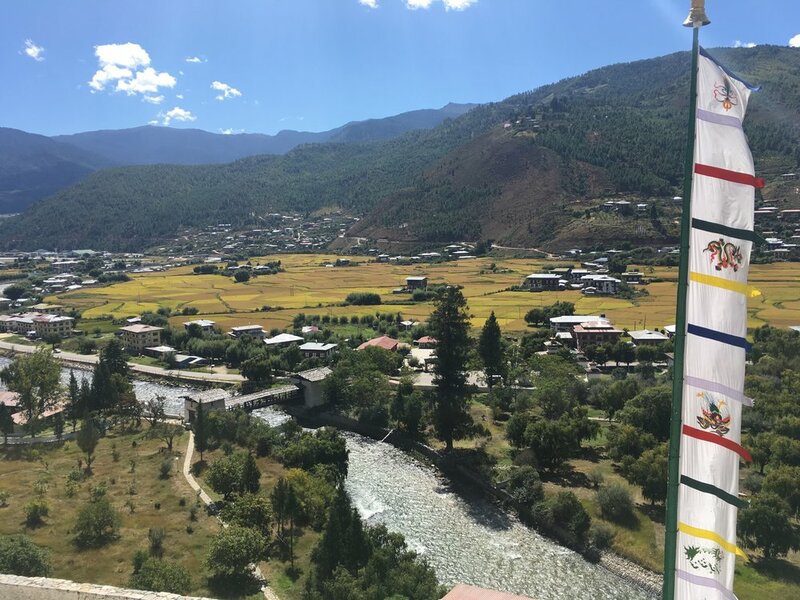 The drive is along scenic paved road following the Paro and Thimphu rivers. 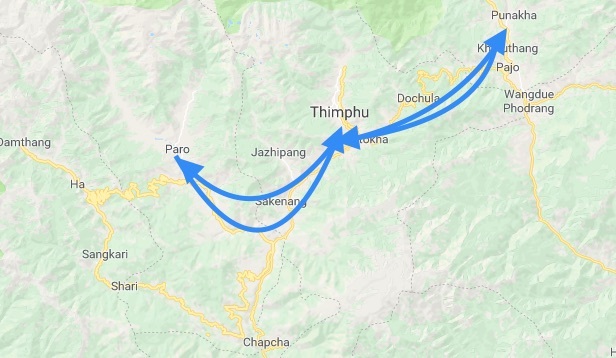 After breakfast we will drive 12km north of Thimphu. We will then hike up to the Cheri Monastery and practice yoga and meditate in the centuries old monastery. As we walk down through the forest we have the incredible view of the Thimphu valley. By the riverside we will dine al fresco enjoying a picnic lunch. In the early evening we will visit Tashichho Dzong. After breakfast you will drive to Punakha, the former capital of Bhutan. 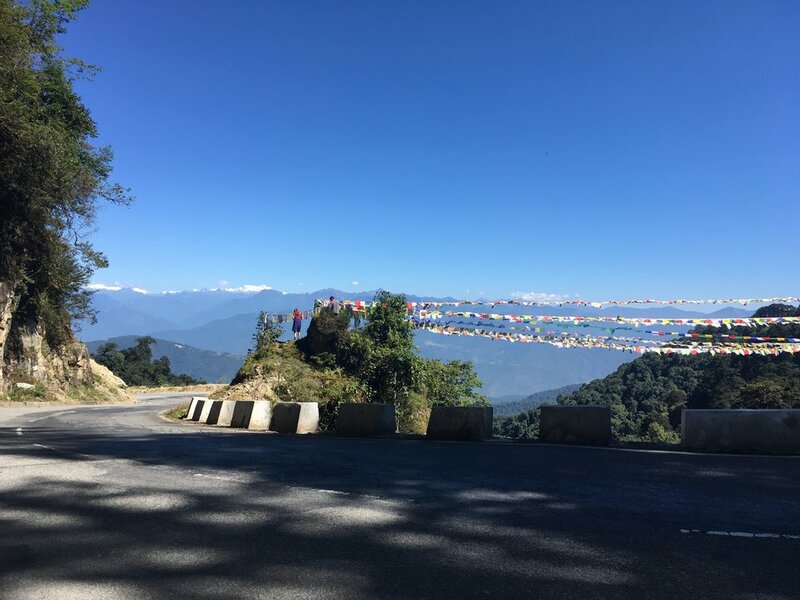 The drive takes us across the Dochula Pass (10,230ft) which is marked by a large Bhutanese chorten (Buddhist monument) and prayer flags. We will stop on the pass for tea and if the weather is clear, we will take in beautiful views of the high peaks of the eastern Himalayas. 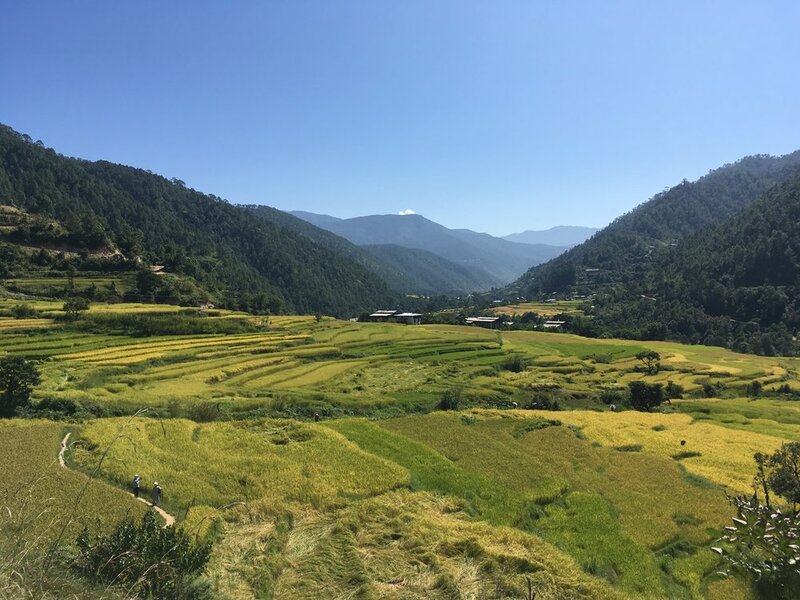 The road to Punakha winds down from the pass meandering through magnificent pine and rhododendron forests, giving a glimpse of some of the most picturesque countryside in Bhutan. After lunch, we will walk through Metshina Village during our 40-minute walk through the rice fields to Chimi Lakhang, which is a fertility temple. 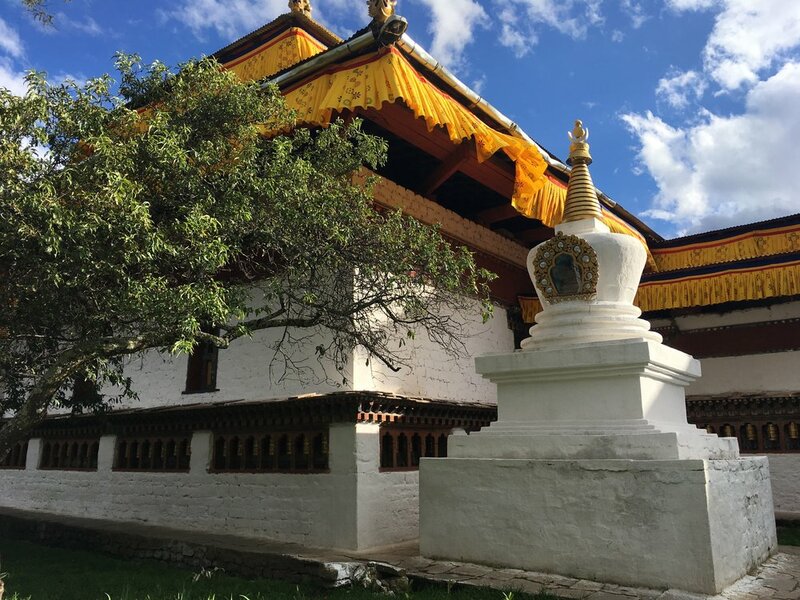 After breakfast you will hike to KhamsumYulephelma chorten (approximately 2 hours) and then in the afternoon you will visit Punakha Dzong, Which is noteworthy both for being one of the most beautiful dzong in Bhutan and also for having been built by the Zhabdrung in 1637. After breakfast you will drive to Thimphu. In the afternoon we can visit a vegetable market and late afternoon drive back to Paro. 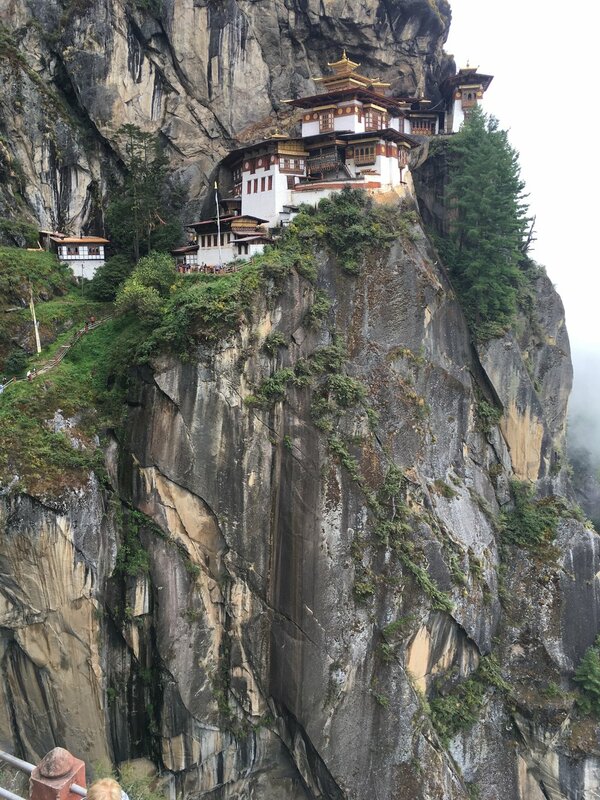 monastery, Taktsang. 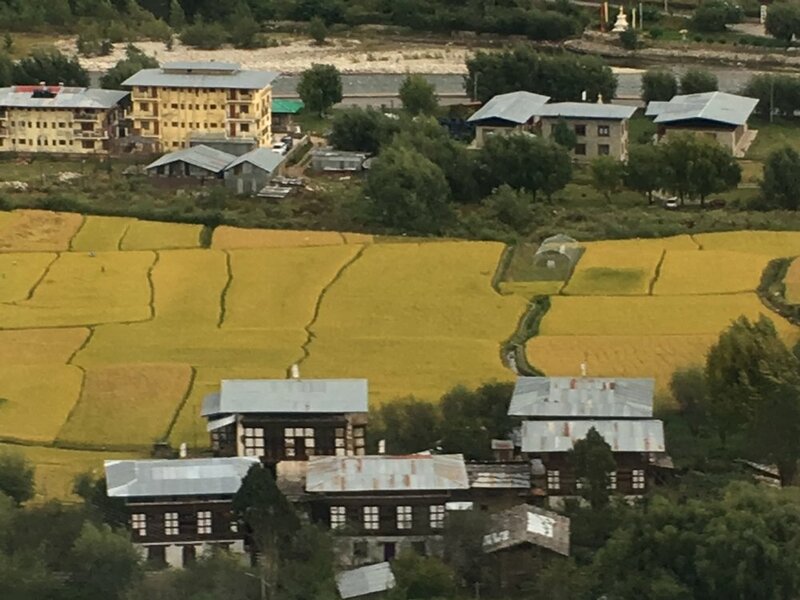 It is perched on the edge of a steep cliff, about 900m above Paro valley. 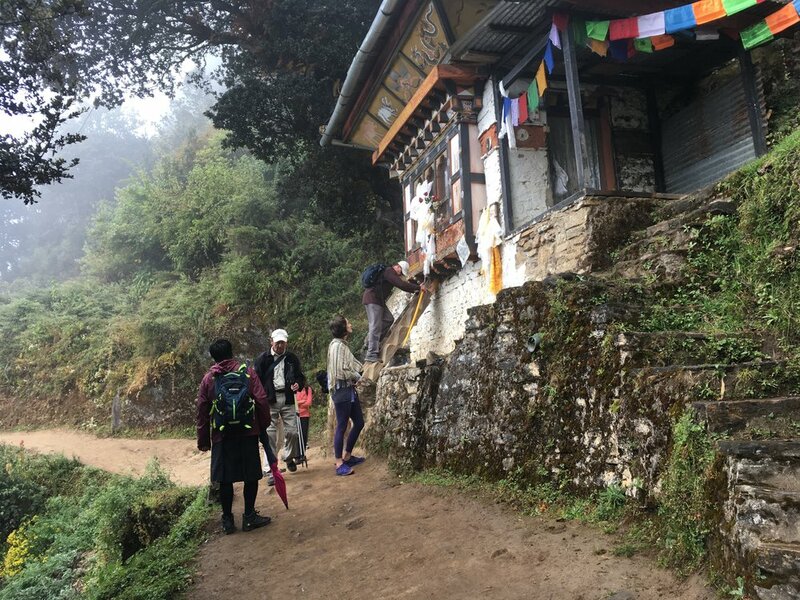 The hike to reach the viewpoint to the monastery makes for a nice half day excursion. In the evening if you want you can enjoy a traditional hot stone bath at the farm house along with dinner. A 20% non-refundable deposit (unless the tour is cancelled by us) is required to reserve your place on this tour. Full payment is due 90 days before departure. Any other tours and transfers other than those mentioned above.